Hunter Swisher is growing a business while helping grass and plants grow in a healthier and more sustainable way. While an undergraduate studying plant science at Penn State, he learned about decades of university research into ways of growing stronger plants while using less fertilizer. Now he's the entrepreneur taking that research out into the market as the founder of Phospholutions, a State College-based startup company he incorporated while still a student. The company's signature product is Rhizosorb, which soaks up and holds fertilizer in the soil until the plant uses it. That forces the roots to grow deeper, creating a stronger plant, and reduces the amount of fertilizer needed as well as fertilizer runoff, which can be damaging to the watershed. "It has a lot of effects on plant growth and water quality," Swisher explained. "There are a lot of issues with nutrient pollution especially here in the Chesapeake. It also has this cost-savings benefit. We’re going to reduce the amount of inputs of water and fertilizer, so it’s actually going to save superintendents of golf courses and things like that more money over time as they apply our product." Rick Pagett is sold. As superintendent of Penn State Golf Courses, Pagett was approached by Swisher about two years ago. 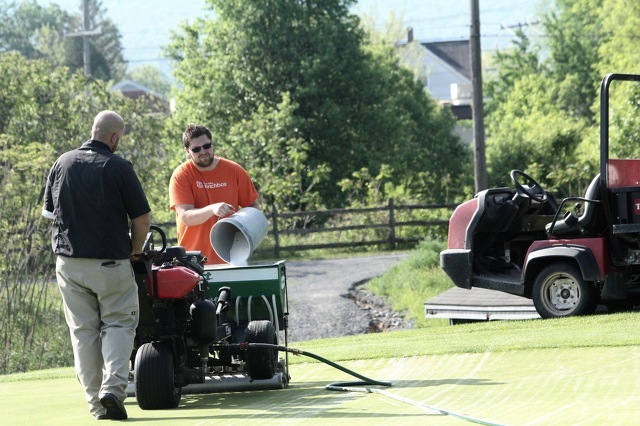 "He came to me a couple falls ago, I think in 2015 and asked if I had an interest in improving my turf health and I said absolutely, we’re always interested in that," said Pagett, a Penn State turfgrass science graduate who teaches some courses in the program. "We wanted to do some small plots, which we did." After applying the product to some plots in the fall of 2015, Pagett and his staff evaluated the effects in the spring of 2016. "Sure enough what he said was going to happen to the turf, it did," Pagett said. "It doubled our root size which is phenomenal." From there, the Penn State Golf Courses became Phospholutions' first big golf course client, applying Rhizosorb to nine greens on the Blue Course. On Thursday, joined by Penn State President Eric Barron and staff from several of the university's entrepreneurial assistance programs, course staff began expanding it to the White Course, making it 10 greens now benefiting from Swisher's product. 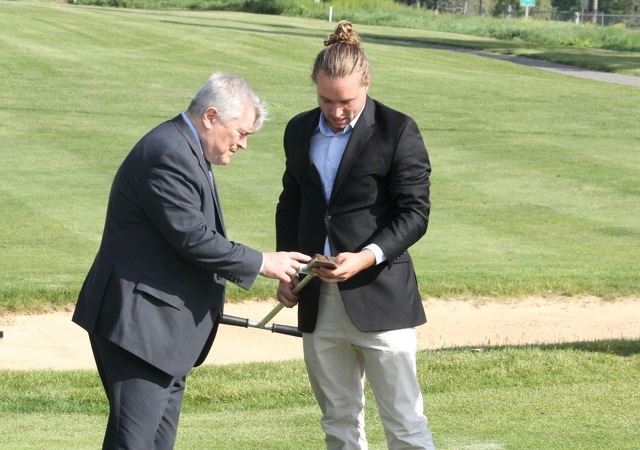 "We’re proud to partner with Hunter and see what that can do to not only improve turf health but also help us become more sustainable," Pagett said. "If there are less inputs on our turf we’re going to be a more sustainable golf course in the future -- healthier turf, less inputs and in turn less dollars going into the facility." For Swisher, the seed was planted back when he was studying in the College of Agricultural Sciences that he could take years of peer-reviewed research and commercialize it. "It inspired our research into commercialization, so we’ve been trying to take this product out to the field, trying to get into new markets," he said. "It’s an environmentally sustainable product researched here at Penn State and we’re known for our turf program so it’s a great place for us to start. We found a need and we found the value of the product. It just fits right along with our university." Along the way, the startup has been nurtured by the growing entrepreneurial ecosystem at the university and in State College. Swisher has taken the company through three business accelerator programs -- Happy Valley LaunchBox, the signature program of Barron's Invent Penn State initiative; Techelerator, a partnership between Penn State, the Ben Franklin Technology Partners and the Centre County Industrial Development Corporation; and the Summer Founders Program, a Penn State initiative that gives student teams $10,000 to work on their startups. He's benefited from the university's Venture and IP Conference and received assistance from the Small Business Development Center, Penn State Law Clinic and IP Law Clinic. Swisher also recently brought on Ben Nason, a recent Penn State grad who has helped successfully launch other startups and is very involved in the local entrepreneurial community, as his chief operating officer and first full-time employee. "We want to give a thank you to all of those resources," Swisher said. "We wouldn’t be here today without all of the opportunities that Invent Penn State has opened up for us. We get everything from our legal help, to the business accelerator programs and development to assistance on consulting and marketing. We’ve done everything there is happening at Penn State. We really owe it to those initiatives." A State College native and 2012 State College Area High School graduate, Swisher earned his degree from Penn State in December 2016. He plans on keeping the company in the area as he sees it as a booming environment for entrepreneurs. "I grew up here in State College, went to Penn State and I’m continuing to stay here mainly because of the ecosystem that’s been developed here," Swisher said. "I feel like this is a place where entrepreneurs are starting to realize we can settle down and have a great community, a lot of resources and bumping into other entrepreneurs all the time. And now we have Penn State backing up this initiative and opening the resources and the buildings that we can all join and work in this co-space. "Honestly I don’t see myself leaving anytime soon because my network, my resources and everything else are here." Golf courses have been the initial foray for Phospholutions, but Swisher says they are expanding into other markets, including sod production, athletic fields, lawn care, and greenhouse and flower production. Pagett meanwhile, said he's happy to have Penn State golf courses be Swisher's model as the business moves forward. "With a small startup company it’s always tough to get your name out there and get people to recognize you," Pagett said. "I think having Penn State backing what he’s doing that will go a long way to get people to realize what’s happening and what he can do." Traffic on a portion of East Beaver Avenue will be restricted to one lane next week as construction crews bring in a tower crane. 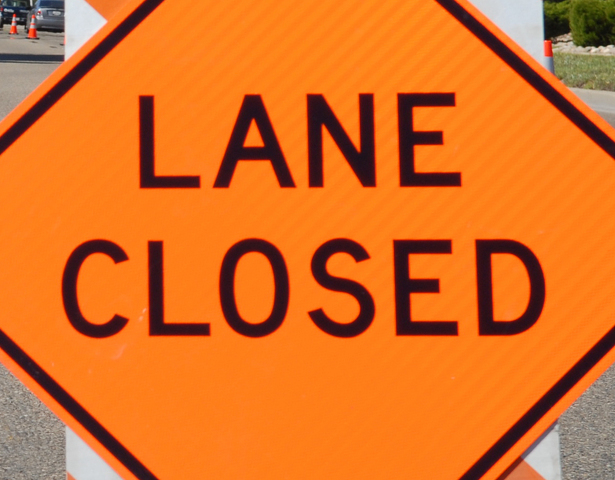 The 200 block of East Beaver Avenue between Pugh Street and Locust Lane will be down to one lane from Monday through Thursday. The project is weather dependent. Travel delays are possible and pedestrians and motorists should use caution moving through the area.